Are your gums sore and bleeding, mum-to-be? You may have pregnancy gingivitis. Pregnancy comes with a host of changes to your body. We know the big ones, such as morning sickness, tender breasts and the “mask of pregnancy”. But one pregnancy sign you might not be familiar with is sore gums in early pregnancy. Known as pregnancy gingivitis, this is most commonly experienced between months two and eight of your pregnancy, and may affect up to 40% of women. What causes sore gums in early pregnancy? Are there risks involved? And what can you do about sore gums in early pregnancy? Let’s find out. What causes sore gums in early pregnancy or pregnancy gingivitis? If you’ve brushed and flossed your teeth and noticed a fair amount of blood when you spit out, you may have pregnancy gingivitis. What causes it? When you are pregnant, your levels of the hormone progesterone are high. This increased level of progesterone promote the growth of gingivitis-causing bacteria in your mouth. Your gum tissue will also become more sensitive. All this may lead to sore gums in early pregnancy, or pregnancy gingivitis. These hormonal changes also interfere in your body’s regular response to bacteria, which may lead to periodontal infections (gum disease). Plaque easily builds up on your teeth, too. While you may first encounter sore gums in early pregnancy (around the two-month mark), pregnancy gingivitis usually intensifies in the eighth month of pregnancy. Are there any risks of pregnancy gingivitis? Several studies have highlighted pregnancy risks due to pregnancy gingivitis. The most significant of these is premature birth. In a study published by The Journal of the American Dental Association, pregnant women with gum disease were up to seven times more likely to have a premature birth (before week 37) than women with healthy gums. Those with severe gingivitis (periodontitis) could even deliver as early as 32 weeks. Follow these dental hygiene rules from the beginning of your pregnancy, in order to minimise the risks of pregnancy gingivitis. Brush your teeth twice a day with toothpaste that contains fluoride. If your gums are easily irritated, switch to a toothbrush with soft bristles. 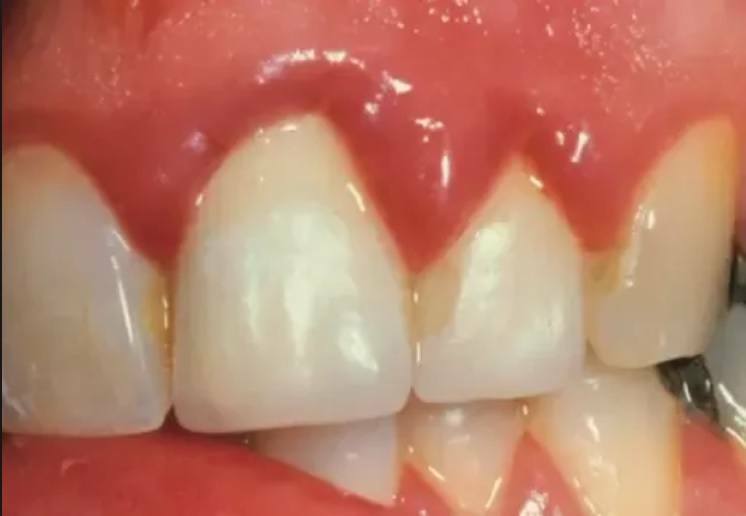 Don’t neglect the tops your teeth where they connect to your gums. In addition to brushing your teeth well, it’s also important to floss. This helps get rid of tiny particles of food and plaque that might be trapped between your teeth and gums, which the bristles of a toothbrush cannot reach. If you’re experiencing sore gums in early pregnancy, gargling with a sea-salt solution can help ease the soreness. Just dilute one teaspoon of sea salt in one cup of warm water. Swish around your mouth after brushing, gargle and spit out. This is one of the best ways to prevent pregnancy gingivitis. Your dentist is trained to spot tiny signs that you might miss, and will be able to nip the problem in the bud. If you just have not been able to ward of gum disease in your pregnancy and have developed pregnancy gingivitis, please visit your dentist without delay. She or he might put you on a course of antibiotics that can get rid of the bacteria causing the gum infection. There are also special mouthwashes that your dentist may prescribe. Mums-to-be, the good news is that even though you might suffer from sore gums in early pregnancy, the symptoms should disappear after your baby is born. Still, it’s best to be informed about pregnancy gingivitis so that you know how to prevent it and keep both you and your baby safe and healthy.